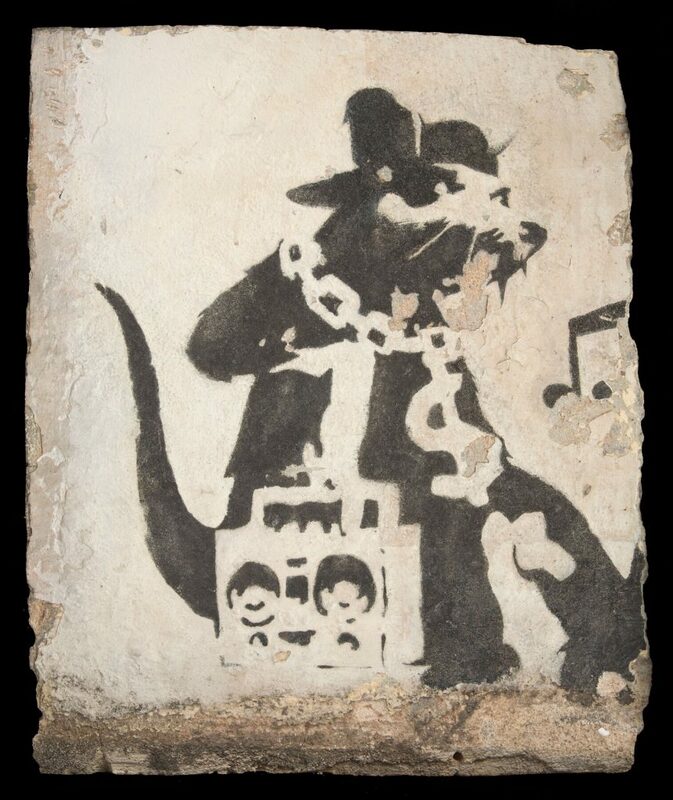 Banksy will lead a world class array of work by some of the most talked about and renowned artists of today at Julien’s spring edition of the triannual live and online Street and Contemporary art auction in Beverly Hills on April 25. Two important works by Banksy, Hayne Street Ghetto Rat ($60,000-80,000) and Blowpop Records ($8,000-10,000) will feature alongside art by Invader, Mr. Brainwash, KAWS, Damien Hirst, Shephard Fairey, Sandra Chevrier, Takashi Murakami, Ai Weiwei, David Hockney, Alec Monopoly, RETNA, D*Face, FAILE, Max Zorn and others. SD_10 (aka The Mothership) ($60,000-80,000) a monumental tile mosaic by the French street artist Invader was created in 2010 on the facade of the Art Center Building in San Diego as part of the exhibition Viva la Revolucion: A Dialogue with The Urban Landscape organized by the Museum of Contemporary Art (SD). The building is currently being remodeled and the mural must be sold in order to protect it from demolition. 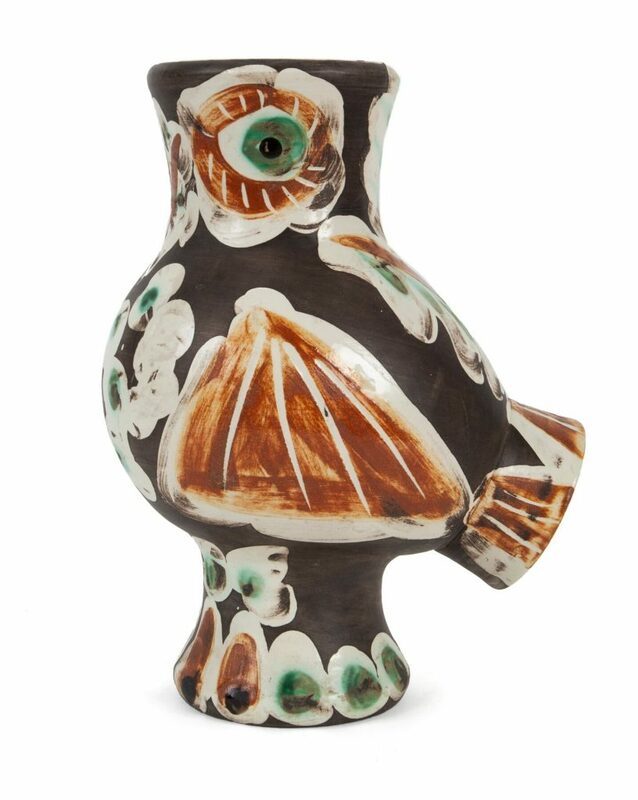 Other highlights include Mr. Brainwash’s Madonna ($10,000-15,000) an original acrylic work on canvas featuring the same base image of Madonna created by Brainwash for the cover of the Celebration album; Pablo Picasso’s master work Wood-Owl ($20,000-30,000) a painted earthenware vase from a limited edition of 500; Damien Hirst’s I Love You ($10,000-15,000) a screenprint from a limited edition of 14; and Shephard Fairey’s Obey with Caution ($8,000-10,000) a unique artist’s proof. 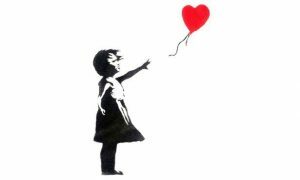 Just when you thought it was safe to come out of the shredder the sale of Banksy’s Girl with Balloon was confirmed by Sotheby’s with the new title Love is in the Bin. 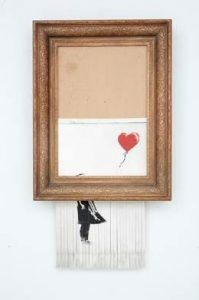 “Banksy didn’t destroy an artwork in the auction, he created one. Following his surprise intervention on the night, we are pleased to confirm the sale of the artist’s newly-titled Love is in the Bin, the first artwork in history to have been created live during an auction.” said Alex Branczik, Sotheby’s Head of Contemporary Art, Europe. 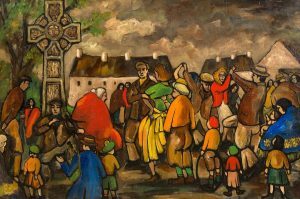 The buyer, a female European collector, commented: “When the hammer came down last week and the work was shredded, I was at first shocked, but gradually I began to realise that I would end up with my own piece of art history”. 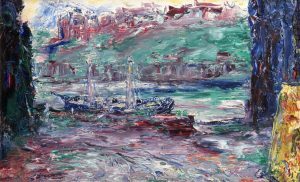 She has confirmed her decision to acquire the new work at the same price of £860,000 at hammer and a final sale price of £1,042,000 with Sotheby’s commission. 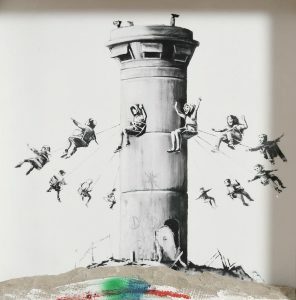 Banksy has a history with pranking art establishments, having previously pulled stunts in the Louvre, Tate Britain, the British Museum, the Museum of Modern Art, the Metropolitan Museum of Art and the Natural History Museum. 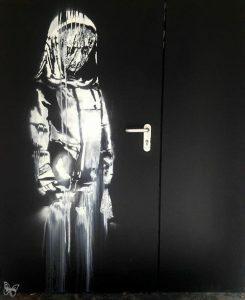 Works by Banksy, the world famous anonymous British street artist, are set to wow the crowd at Art Source, the Irish art fair which runs at the RDS from November 10-12. Gormleys Fine Art will show a selection of screen prints including Banksy’s iconic Flying Copper image of a policeman, Girl With A Balloon and his Tesco Tomato Soup can parody on the work by Andy Warhol. “We get Banksy‘s work through an external company and each piece comes with a certificate of proof that it is an original piece by the artist,” Oliver Gormley explained. “There is massive interest in Banksy, his work is very eye catching and people tend to do a double take when they see you have an original by him on display,” he added. Prices for the pieces on display range from 9,000 for Napalm up to 150,000 for Heavy Weaponry. 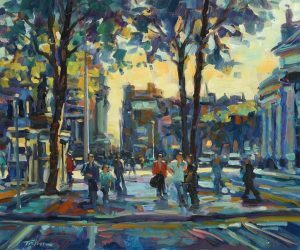 More than 130 contemporary artists and 20 Irish and international galleries will gather together to showcase painting, sculpture, photography, illustration, prints and ceramic art at Art Source. More than 15,000 people are expected to attend. 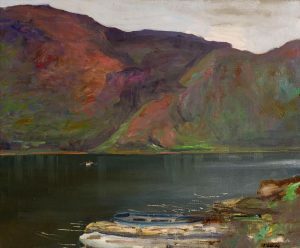 Around 250 artworks illustrating the role Britain played in the development of modernism will feature at Sotheby’s Made in Britain auction in London on March 16. 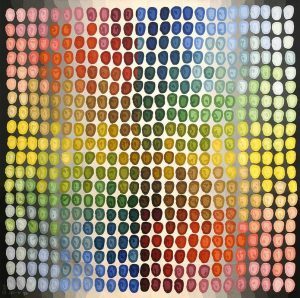 The sale encompasses fine art, prints, sculpture, photography, studio ceramics and design. This is the fourth Made in Britain said and estimates start at just £200. There are works by L.S. Lowry, Damien Hirst, Patrick Heron, Norman Parkinson, Frank Auerbach, Mary Fedden and David Hockney. 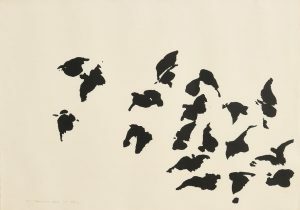 The auction will also offer 19 works from the collection of the Martyn Goff, the driving force behind the Booker Prize. His first novel, The Plaster Fabric, was published in 1957. 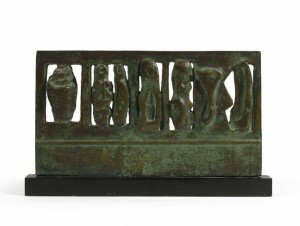 A highlight from the collection is a maquette for Henry Moore’s screen for the Time-Life building in Mayfair (£15,000-20,000). Henry Moore – Time-Life screen. 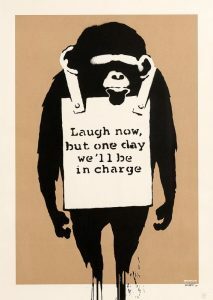 Banksy’s Have a Nice Day.